Based in the sunny seaside town of Brighton England, Firing Pin Games is an independant games developer founded by Alex Dawson in 2012. Alex Dawson is the backbone/heart of the company fulfilling artwork, design, management and programming roles and drawing upon his network of games industry veterans to form an extensible team structure based on the demands of any given project. Keeping the core team small allows the company to adapt quickly to change. The aim is simple, to make fun games, enjoy making them and survive the apocalypse. Alex left his role as a games artist for Zoë Mode in 2011 to become a freelance artist, he developed his own game ideas in the down time between contracts. In 2012 he began work on Will To Survive creating Firing Pin Games later that year. 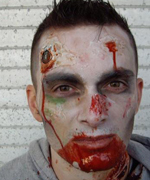 Contrary to the image pictured he is not actually a zombie.